With delightful cubist graphics, easy-to-use touch controls, and a mountain of devious puzzles to crack, Kami Retro by GAMEVIL is one of the best games to appear on the iOS platform in a long time. The object of the game is simple: by placing a variety of different objects in strategic places, you’ll guide characters from start to finish in one piece, collecting as many stars as you can in the process. Kami Retro is a brilliantly-designed puzzle/platformer, reminiscent of the classic game Lemmings. 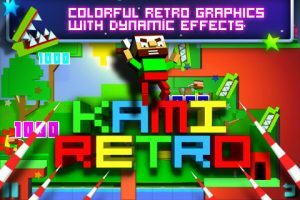 However, while that particular game mechanic will be familiar to some, the beautiful art style and slick presentation make Kami Retro a unique experience unto itself. In Kami Retro, the player is given a stock of four characters whom you must guide from their entry point to the exit of the single-screen level. Your characters charge off in the same direction until you direct them to either jump or change course. 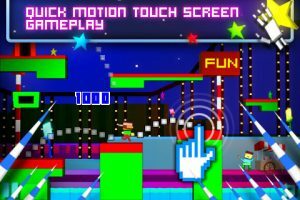 Along the way, you’ll be given different items, such as trampolines, giant fans, and springs, each of which must be used to get the characters past obstacles. These obstacles include simple chasms, pools of water, bloodthirsty alligators, and more. Players begin by surveying the level and placing items where appropriate, hoping for the best. 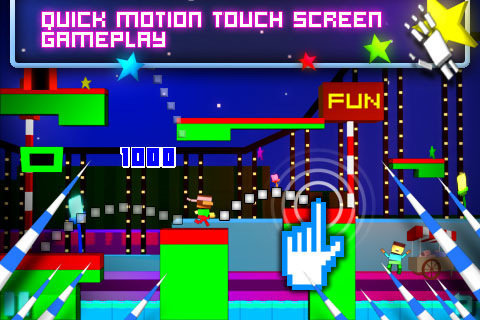 Then, to begin the action, simply tap the entry door and your characters will jump onto the screen at timed intervals. This is key, because the longer if it takes you too long to get one character to the exit, the next character will enter the level, forcing you to control more than one at a time. The most important aspect of Kami Retro is item placement. If you don’t get your springs, fans, and other items placed properly before starting the level, you’ll have to scramble to adjust while your characters go charging toward their doom. 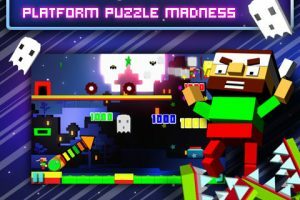 It doesn’t take long before the challenge ramps up in Kami Retro, and you’ll need to use your wits and quick reflexes to navigate your characters to safety. Fortunately, GAMEVIL nailed the controls. To guide your character, simply swipe left or right to change their direction and swipe up to make them jump. Moving objects is as simple as tapping them to activate and then moving them to your desired location. Perhaps the most impressive aspect of Kami Retro is the gorgeous cubist graphical style and its bright color palette. The game is an absolute joy to view and makes for an excellent showcase for the iPhone’s visual capabilities. Bottom Line: Kami Retro is an absolute pleasure in every way. The puzzles will tease your brain and the visual will treat your eyes. One of the best games on the App Store. 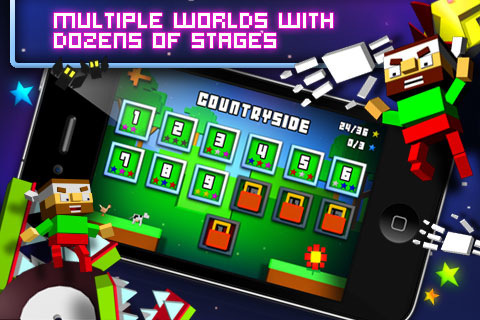 Kami Retro is compatible with iPhone, iPod touch, and iPad. Requires iOS 3.1.2 or later.